Last issue, we updated Halloween Crafts. Christmas Crafts will be next issue. Did you know we have sections for other holidays? Visit Valentine's Day, Easter Crafts, and Holiday Crafts for lots of fun craft projects and ideas. 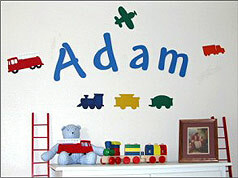 One of this years hottest trends is personalizing your children's rooms or nursery with Wooden Letters. CraftCuts.com offers unpainted or painted letters in over 1,700 fonts, dozens of colors and almost any size. These letters are perfect for your home, kids room or nursery. Craftcuts also offers custom vinyl wall letters, cork boards, wall murals, and more to decorate any wall with your favorite theme. You can see their entire catalog and picture gallery at www.CraftCuts.com. We've finished the new holiday crafts section. Valentines, Easter, Halloween & Christmas already have their own sections; this is for the other holidays from New Year's to Thanksgiving.